I didn’t head out for a run in Austin to develop an equality epiphany. My original goal was to share one of my favorite running cities with the #wwwp5k crowd. I started with a simple thought, “Hey! Wordpress is doing a bloggy run thingy? I blog (occasionally) and run (even more occasionally) so I accept your challenge WordPress!” Everything about the blogging while photographing while running challenge made my multitasking soul tingle. Even better, I found myself in Austin away from my family which meant my normal wife and parent duties could be replaced by a photo blogging run. Austin is one of my favorite running cities, and I have epic running memories there. I did my only marathon in Austin. I had an amazing trail run wipe-out in Austin, and hours afterwards gave a speech in front of hundreds of people. Unbeknownst to me I didn’t bandage my wounds well, so during my presentation blood began dripping down my leg from under the gauze. (Let me tell you, people really pay attention when you are up on a stage, leg oozing blood, and you are wearing a skirt and heels.) Austin is a running happy place for me, and Town Lake? It’s a special idyllic natural haven in the heart of downtown. Now, before you get all impressed with my running ability – “Well I’ll just run…let’s say…over twice as far as I planned” – you should know a couple of things. 1. I live in Colorado and was running in Austin. Sea level is totally my friend. 2. I didn’t run all 7.3 miles. I ran out the whole way and then ran/walked on the way back, so I ran a 5k and then went extra at a variety of paces. Let me show you this amazing running city! First off, proof that I was in Texas. Even the pedestrian bridge that runs across Town Lake features Lone Stars. Yee haw! It was here, just over a mile in, that my route went awry. I think I turned left off the bridge when I normally turn right. Or maybe I don’t usually cross this bridge? Anywhoo I was not on my planned route, but not lost. As soon as I passed under a bridge, heard high pitch squeaks from above, and saw this warning sign I knew: Congress Street. Past the bats I start seeing the things that make me really love running on Town Lake. The water, the water birds, the lush greenery and look! Rowers! I don’t see many rowers in Colorado. One specific lady caught my eye. It’s hard to tell from the picture, but the woman in the back of the nearest boat is rowing in a hijab. It was 92 degrees out, I was sweating buckets in my tank top and running shorts, and this amazing lady is out there rowing. I wanted to jump into the lake, swim over and applaud her ability to exercise in that heat with a head scarf. Seeing her got me thinking about equality, and how much of the world is up and arms about what women choose to wear on their heads, or at the beach, or while participating in the Olympics. It seems like we are always wearing too much or not enough to cover or show off our bodies. My brain was working when suddenly, my dirt path changed and I was running on this really cool winding concrete bridge thing. The only mile marker I saw. I was 8 miles from somewhere! Does anyone ever work out at these outdoor gyms? Anyone? Ever? Ah mile markers. I only saw this one, which really gave me no idea how far I’d gone, since you need two for context, but I kept going. Then I saw an outdoor workout area that no one was using, or has ever used. (Really, does anyone ever use these things that are on all running paths all over the United States? Anyone?) Just past the vacant outdoor gym I came to a shaded path that looked like a welcome reprieve from the heat of the day. It jutted out into Town Lake and no one was on it. This was the location of my equality epiphany. I jogged in place a bit, then just stopped and waited to see if anyone went on or came off the trail, but no one did. As much as I wanted to explore, the solitude just didn’t seem safe. 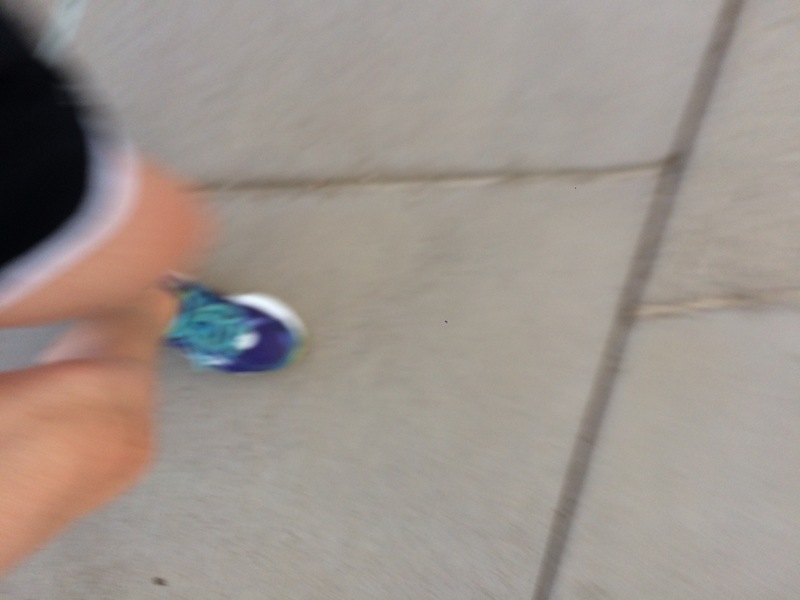 I ran out a bit farther, then decided that it was hot and I was tired, so I started walking home. I was vacillating between feeling like a wimp for skipping the shady trail and feeling proud for being safe. As I was berating myself I was distracted by this odd sign. No fishing on this concrete sidewalk please. The hooks get stuck in people when you cast and really, we’ve just heard the sidewalk fish just aren’t biting. Also if you do manage to catch one they taste really gravely. No fishing in this area. It’s best for everyone. Oh! Look at this cute little guy! Really. Really Pokemon Go? You are going to INSULT me? Oh yeah, Pokemon Go developer? You are going to mock me while I’m out exercising? You are going to throw a Slowpoke at me? I mean, I know I stopped running to walk a bit but do I deserve this? I did not, but since I was wasting battery life, and having a charged phone – and not being distracted by Pokemon Go – is key to being safe, I stopped my game. I acknowledge that my aforementioned multi-talking soul took it too far here. With the sun setting I picked up the pace to ensure I missed the gob o’ bats. (Did you look it up yet?) and then stopped to photograph the paddle boats heading out to watch the evening bat surge. With that I headed back to 6th street and down to my hotel, managing to catch this last selfie as I went. Austin, how I love your running scene. Whether I’m heading out to Zilker Park, my planned run, or exploring this newly discovered “Ann and Roy Butler Hike and Bike Trail” and boardwalk, I’m never disappointed. Readers, I hope you all enjoyed the run, and check out Town Lake the next time you are in Austin. Watch out for virtual Slowpokes and literal bats! Oh, and be safe out there, wherever your feet take you. 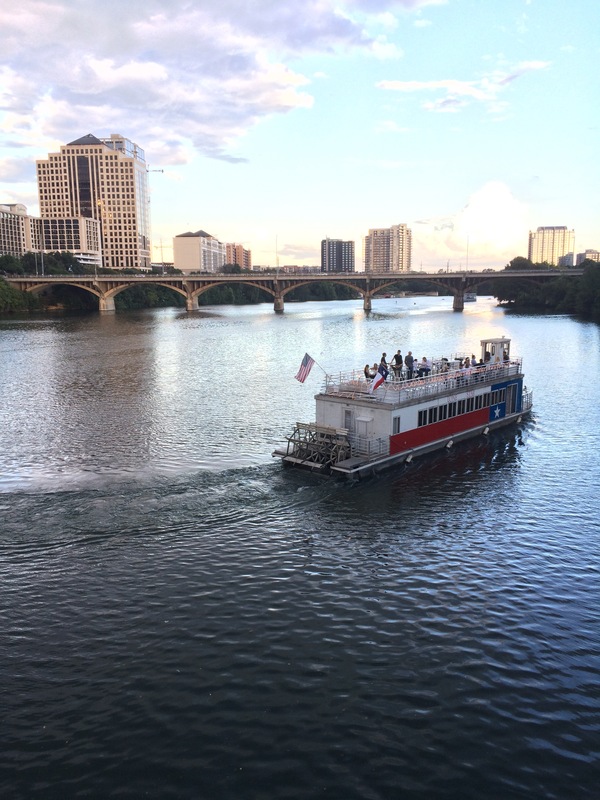 Second part of my musings of my 5k around Austin, Texas and part of the WordPress WWWP5K.